Join in the fun and engage in battle! Our flagship activity. Combat Archery is like dodgeball played with bow and arrows. You game starts with instruction from your game leader followed by an hour of heart pumping arena combat. A perfect activity for kids birthday parties. A Nerf gun fight at Combat Archery Edmonton is nothing like playing at home. Our indoor Nerf arena is 5200 sq foot arena includes bunkers, towers, hiding spots and a huge variety of Nerf guns. You'll enjoy engaging in a mock battle against your opponents. On the game leader’s say both teams run the the centre of the arena, collect as many arrows as they can and they run for cover. Archers load their arrows and try to hit a player on the opposing team. You can dodge, hide behind obstacle or even crouch in the sniper tower to avoid incoming fire. When you get the chance you release your arrow and if you hit a player they are out…but be careful if they catch your arrow you are out! We do Birthday Parties, Bachelor/ette Parties, Team Building and Drop in sessions. 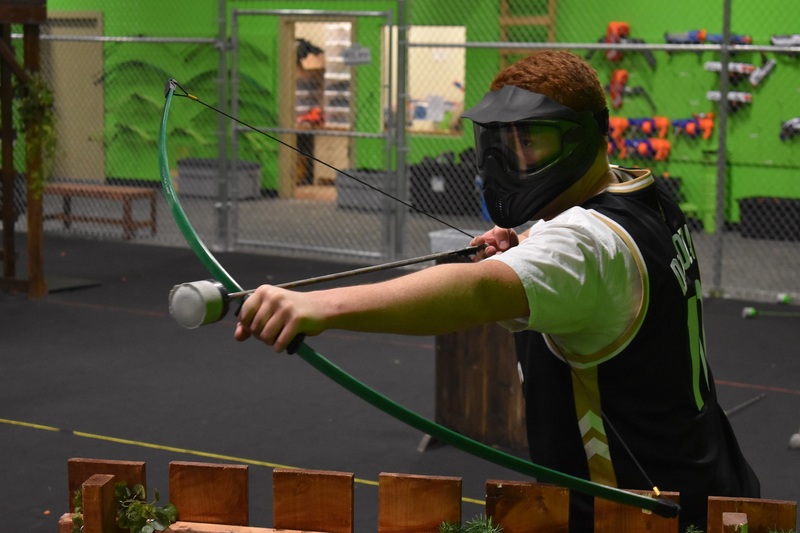 We offer Combat Archery, Nerf Wars and Blacklight dodgeball. You can book a game for yourself, a friend, a small group, large group or book the entire facility for your group for a private event. We also offer adult dodgeball and combat archery recreational leagues. Our facility includes two party rooms which can be combined into one large party room complete with a kitchenette for large gatherings. Use of these areas is included with the booking of a party for your group. Experience the thrill of combat archery. Bring your family and friends and joun in on the fun!